You are at:Home»Reviews»What is the best Smart Thermostat? The days of relying on an inaccurate spin-dial thermostat are long over. Programmable thermostats have come a long way over the last decade, and one of the latest advancements is something known as a smart thermostat. While regular thermostats allow you to adjust and set the temperature in a room with a control panel or dial, smart thermostats give you greater control over your home’s heating and cooling system. Think of it this way: a regular thermostat allows you to adjust the temperature in the house by using a control panel for your HVAC system. A programmable model is a step up, allowing you to set a specific temperature and have it change automatically throughout the day. What makes a smart thermostat “smart” is the fact that it can learn from your behavior and preferences, show energy use in real time, adjust based on ambient environment conditions like humidity, and allow you to control your home’s temperature settings remotely. Curious if a smart thermostat is the right choice for you? If you want more control over your HVAC system and home environment with greater energy savings, a smart model is probably right for you. This guide will walk you through the process of choosing the best thermostat for your needs and explain what to look for. Low upfront cost. While a smart thermostat is more expensive than a standard programmable thermostat, it is still one of the most affordable energy upgrades you can make to your home. Most smart thermostats range in price from $200 to $450. Energy savings. A programmable smart thermostat can save you about $180 a year, according to Energy Star. While any programmable thermostat can save you money, a smart thermostat can give you insight into your energy use, including showing you exactly how much energy you are using on any given day and how much adjusting the temperature will save you. Adjust your home’s temperature remotely. A thermostat enabled with Wi-Fi allows you to adjust your home’s temperature while you’re at work or even on the other side of the country with an app on a smartphone or a computer. Most smart thermostats even tell you how long it will take to get your home to the temperature you select. This makes it easy to get your house to the perfect temperature as you head home without wasting energy. Internet connectivity. Because smart thermostats can connect to your home’s Wi-Fi, it opens up a huge range of possibilities. Some models can learn your preferences and automatically adjust heating and cooling levels, while others give you an in-depth breakdown of your energy use. You can learn more about the many features in the following section about what to look for in a thermostat. Despite the advantages, a smart thermostat isn’t necessarily right for you. Virtually all smart thermostats have a higher initial cost than a simple model. While many of the most popular models are designed to be installed fairly easily, you will still need to know what you’re doing or hire a professional, which adds to the cost. While $300 to $500 is not a huge investment for a homeowner in terms of energy improvements, it can be a high cost for renters or people who are planning to move soon. Of course, you can choose to install the thermostat yourself and take it with you when you move, in which case the thermostat will pay for itself over time. Finally, you may not necessarily save much money by switching to a smart thermostat if you are already the type of person who turns your thermostat off every time you leave the home and carefully conserve energy. The energy savings can be compared to more affordable programmable models, although a smart thermostat does show you how to optimize your energy use to save a bit more each month. Currently, as last updated, the reviewed products for this list include the following. You can continue to read further to understand what you need to look for in a thermostat and to better understand how and why we reviewed the product on the list. We hope to help you out with your purchasing choice of a smart thermostat. The following are the most popular and highly rated smart thermostats currently on the market. The Nest Thermostat was one of the first smart thermostats, and it remains one of the very best. The Nest combines a great design and bright LCD screen with a remote energy management and a number of tools that help you save money while better managing your home’s environment. 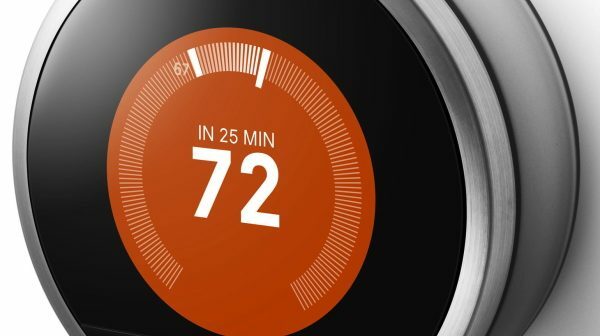 The Nest is also a learning thermostat. This means it can sense when you’re home or when humidity gets too high and adjust itself. The Nest learns your preferred temperature settings from your manual adjustments and begins to adjust your home’s temperature with no programming necessary, although you can always edit its settings. Remote control. The Nest connects to your Wi-Fi so you can control if from a tablet, laptop, or smartphone with an app. Auto-Away, which automatically reduces the temperature to your pre-set minimum when you leave the house. Auto-Schedule, which remembers the temperatures you prefer throughout week and adjusts itself automatically. Energy history shows you how much AC or heating you have used in the last 10 days and why so you can adjust your settings to save money. Airwave saves on cooling costs by automatically reducing AC run time when humidity is low. Attractive and intuitive interface. Every Nest setting can be controlled by either spinning the ring or pushing on the device face. The display is red when heating and blue when cooling. Easy installation. With a bit of know-how and clear instructions, the Nest can be installed in under 30 minutes. One of the biggest drawbacks of the Nest that users complain about is it doesn’t have external sensors. This means you can’t feed Nest temperature or data from other locations without hardware, which can be a problem when the Nest is installed on a floor that is not used as often or in a hallway that is rarely used. Nest’s most popular feature among users is its energy usage and savings reports and intuitive design. The Ecobee3 thermostat is a major competitor to the Nest and sold at the same price. It does offer some unique advantages over the Nest, particularly if you have a large home but one HVAC system or you want to measure the temperature in rooms where the thermostat is not installed. The Ecobee3 features a touchscreen that you use like a smartphone app. This can make it easier to access information at the touch of a finger. Tapping the cloud icon, for example, brings up your local weather forecast. This model is more high-tech than others, and it offers several unique features, most notably its remote sensors. It comes with a single battery-operated sensor that you can place elsewhere in the home. This sensor monitors occupancy and temperature so the device can better monitor temperature and occupancy throughout the house, not just the room where the thermostat is installed. Up to 32 additional sensors can be purchased. One included remote sensor to measure temperature and occupancy throughout the home. Up to 32 additional sensors can be installed at an additional cost. Mobile app allows you to control your HVAC system remotely. Turns on your heating or cooling based on your home’s energy profile and outside weather. Intuitive interface with a large color touchscreen. Users have pointed out several drawbacks to the Ecobee3 thermostat. This model has high power needs, which can make it much harder and more expensive to install than other models if your home doesn’t have a common wire. Users have also complained that the smartphone app sometimes quits randomly and is less than responsive when it does work. The Honeywell Wi-Fi Smart Thermostat is one of the more affordable smart thermostats available today. 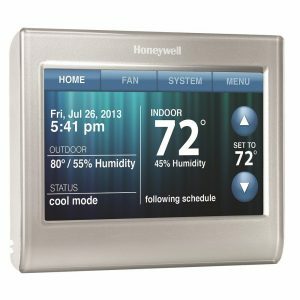 If you like the look of a traditional thermostat but you want something that is more adaptable with remote HVAC control, the Honeywell may be a good choice. This thermostat offers some neat tricks to make it stand out from the competition, including its ability to match the touchscreen display to the wall or any other color you hoose. 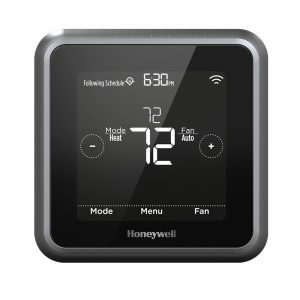 The Honeywell also helps you stay on top of things with email and smartphone alerts when your home exceeds your temperature and humidity extremes, when you need to change your filter, or even when your Internet connection goes down. The Honeywell smart thermostat learns how fast it takes to heat or cool your home, then makes it happen with the least amount of energy. It doesn’t learn your preferred temperature settings by your manual thermostat adjustments, but this may work better for you if you frequently adjust your thermostat. Easy set-up with onscreen assistance and the ability to choose the display’s color scheme. Smartphone app for iOS and Android devices offers remote HVAC control. Smart Response temperature timing learns how much time is necessary to reach your preferred temperature. Programmable mode saves on annual energy costs. The most common complaint about the Honeywell thermostat is its fairly basic and blocky design that’s smaller than it looks. 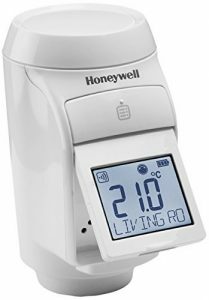 Some users have also complained that the Honeywell can’t learn from your manual temperature adjustments the way other models, like the Nest, can. As an addition to the best smart home thermostats, we chose smart thermostats that will suit your budget well. They, however, are not as fancy as expensive ones, and might not have all the features of their more advanced relatives, but will work well and fulfil all your everyday needs. 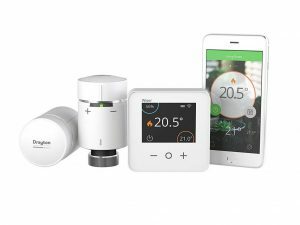 Here are five rising stars that we suppose will soon stand shoulder to shoulder with all famous full-featured models of smart thermostats. If we want to make a short intro to a story about Emerson Sensi, it will be: it is a great smart thermostat! Sensi is a well-liked alternative to fancier smart thermostats, and it got an average rating of 4.5 out of 5 stars on Amazon.com. With its traditional look, it might suit your home interior better than some of the more futuristic-looking thermostats. It’s very slim against the wall, and the white plastic body won’t be smudged by fingers. Setting up an account can only be done through the mobile app, and you can use the free Wink app instead of Sensi app if you like it better. You will receive instruction for installation through an application. Be sure to write down the access code found on the back of your Sensi before you mount it to the wall because you’ll need it during setup. You can control it directly through the interface, but the real benefit lies in the free app that’s compatible with both iOS and Android and can work with Amazon Echo. You’ll be able to take full control of your thermostat from your smartphone or tablet through your router’s Wi-Fi connection. You can check humidity, temperature and fan settings from the mobile app as well. The Sensi is compatible with the majority of combined HVAC systems. It will work with forced air systems including gas, oil and electric, heat pumps including those with auxiliary heat, hot water boilers, radiant heat systems and it has up to four stages of heating and two stages of cooling. No C-wire is required for most systems; the only exceptions are 2-wire heat-only systems, heat pump systems, and AC-only systems. 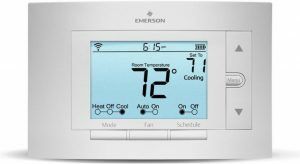 There are several crucial benefits of Emerson Sensi: you can program each day individually or in groups, control of temperature is precise: +/- 1 degree, and you can access schedules, settings, and current mode of operation via an app over Wi-Fi. All your Sensi thermostats can be controlled from a single app. on your mobile phone. Whether you own multiple homes, a business, or some rental properties, you will have the ability to monitor and adjust the energy use of each property from your mobile phone. It also sends email alerts to the email address associated with the Sensi account about critical conditions regarding your home climate. We are all aware that Honeywell Thermostats may not be the coolest ones on the market. But with T5 model Honeywell did some effort and created more appealing smart thermostat with a metallic grey plate colour. It will take you about an hour to install the thermostat and configure Honeywell’s controller app. Honeywell’s Lyric T5 is really easy to install if you already have a C-wire configuration. It is also compatible with a broad range of hardware, including single- and multi-stage cooling and heating systems, heat pumps with and without auxiliary heat, hot water and geothermal heating, and 24-volt gas fireplaces. However, it does not support dehumidifiers, humidifiers, or ventilators. Honeywell Lyric T5 is well connected with Apple HomeKit and Amazon Alexa so you can manage and monitor the thermostat using voice commands. It is controllable via a mobile app and a touchscreen. Even though mobile app is well created – clear, simple, and responsive, there are no fancy learning capabilities or automated schedule adjustments. You can create a schedule and adjust the temperature. Honeywell has a couple of bonus features: The Lyric app supports a geo-fencing feature that switches the thermostat to an Away mode when you leave the house. And you can control home temperatures remotely from your phone, and the thermostat responds in a second or two. Also, use the app or thermostat directly to create custom schedules for 7-day programming, adjusting the temperature on-demand anywhere you have a Wi-Fi or cellular connection. The T5 can be set to automatically determine if the HVAC system should be in cooling or heating mode, so you don’t need to switch modes manually. Energy Star Certified. The Lyric T5 Wi-Fi thermostat is compatible with most single-stage and multi-stage conventional and heat pump heating and cooling systems. Provides remote thermostat control through iOS or Android smartphones and tablets. 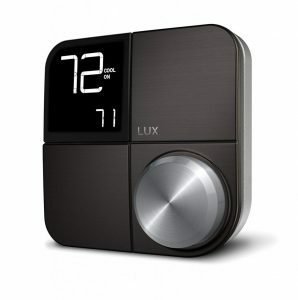 If you wish to buy a basic smart thermostat, then Lyric T5 is a much less expensive option than more advanced models. Still, it has more than just basic features that work really well. The Kono is a reasonably priced way to get smart connectivity in your heating and cooling controls, but it doesn’t give you much in the way of sound notifications. The design is techno-hip and stylish, or plastic and tacky looking – depending on your taste. Different colours are available for your choice and you can change different colourplates following your room’s colour scheme. The Lux Kono comes with a wiring bridge for HVAC systems that don’t have a C-wire. Other than that, installation easy: Screw the back plate onto the wall, wire it up, and snap on the face unit. A mobile application is simple for users. The app asks you questions about your usage needs and schedule. It gives you simple default settings to select about comfortable temperatures and showing you the estimated savings or costs of the various choices. This is a neat way to show how much your temperature preferences could cost you. The simple LCD screen is without dimming effect, always fully bright and shows basic information: what the in-home temperature currently is and what the target temperature is. You can control the thermostat using the Google Assistant, Amazon’s Alexa, or Apple’s Siri. Geofencing. However, it doesn’t support for IFTTT applets. Considering heating systems, it supports both conventional furnaces, air-conditioning units, and heat pumps. Complaints on its features concern mostly customised programming: day-by-day schedule is a lot less user-friendly. Additionally, it doesn’t integrate with other smart home devices, lacks IFTTT support and has no external room sensors. If you wish to achieve excellent zonal temperature control with delightful accuracy and ease than Honeywell Evohome is the perfect choice for you! So let’s check out what are his best performances! Even though it is present on the market for several years, Honeywell Evohome is considered one of the best in the industry based on its easy installation, zonal controls, and a user-friendly interface. Installation of the Evohome system is just slightly more involved than with some other smart thermostats. That goes with the fact that each radiator in your house needs to be fitted with an individual thermostat. You’ll need radiators with TRV valves to start with, or you will have to install one to each radiator. If you don’t need to change valves, the installation of the individual thermostats is very easy: The TRV valves just pop off and the Evohome valves slide on. Honeywell Evohome has been designed to be functional rather than fashionable. It means that it is probably able to fit in with different interior design styles. It has an ‘idle screen’ that you can set to display, with the option to show current settings, but there’s no option for turning the screen off entirely. The terminal has a battery so you can move around the house while setting temperatures. But you have to return it to the dock in the short term, as the battery doesn’t last long enough to leave it off the dock overnight. Honeywell Evohome connects to Wi-Fi, so you can use the app without installing a separate hub. You can also download the Honeywell Total Connect Comfort app which is reliable, easy in design and use, and accessible to multiple users. Evohome slightly lacks in the smart features compared to some other thermostats on the market. It works with Amazon’s Alexa voice assistant in a limited capacity and with the free application IFTTT if you’ve got a Google Home smart speaker, but it has no integration with Apple HomeKit. A benefit of having Honeywell Evohome is in the economics of heating. There’s an ‘economy’ mode that reduces all temperatures across the home by a few degrees if you are out. And it keeps bedroom temperature lower until it is programmed to increase temperature and prepare the room for sleeping temperature. However, installing Honeywell Evohome in each room is not cheap, so when we talk about savings, we talk about long terms. The system learns how quickly your house warms up. 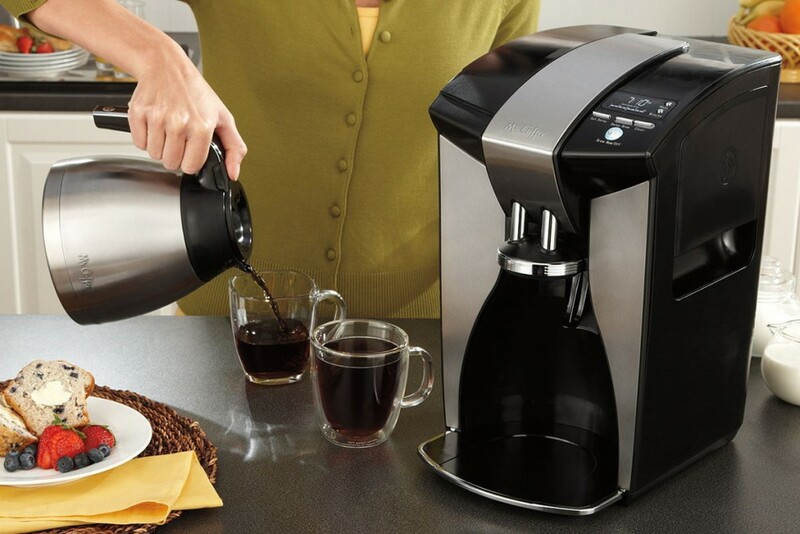 It ensures that the desired temperature is always reached precisely when you want it to. The thermostatic valves recognise when a window is open. They will automatically close to prevent unnecessary heating and notify you about an open window. After analysing its benefits and lacks, if you value convenience and comfort above saving money in the short term, Evohome is the model that we recommend. And speaking of long terms savings, it is even more recommendable! This is the second room-to-room heating system that we checked out for your convenience. It differs from Honeywell Evohome by a starter kit that includes a smart Room Thermostat and two Radiator Thermostats controls. Also, this system has a lower price to start with, and you might consider this a huge benefit. Wiser controls your heating via a wireless relay that has to be wired into your boiler. The best thing about the installation of this system is to be done by a professional. Once the relay is connected to your boiler, you should use the simple app to connect it to your Wi-Fi network. Installation is performed by creating rooms, each of which can hold multiple heating devices. Room thermostat has an LCD screen, simple to use. Its design is also simple, and it will fit well in any room. Both Android and iOS apps are available, and the room thermostat can be connected via each of them. You can use the app to control the system when you’re away. So if you’ve been out for a few days and you return home earlier than expected, you can remotely turn on the heating, so you arrive in a warm home. You can set schedules room by room, with each one having its heating settings. Smart Room thermostat has an ‘Away’ mode that you can set manually, with all rooms dropping to a set temperature when it is activated. This feature is crucial when you leave home as the system doesn’t work with geolocation. However, the system takes into account the external temperature and learns how long your house takes to warm up. Radiator Thermostat’s control work without the screen, all you have to do is to press the + button, and the temperature will rise by 2 degrees. You can also control each room remotely from the room thermostat. Recent updates include support for Alexa and Google Assistant as well as integration with IFTTT. All said Drayton Wiser Heat System is a simple and wallet-friendly way of adding a multi-room heating control to your home. Easy controls and apps make it one of the simplest systems to use. 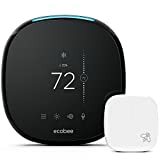 If you want to purchase one of the newest products available on the market, you can also go with Ecobee 4. Nevertheless, you should proceed with caution. The upgrades that come with the device are quite noticable. For example, while both the Ecobee 3 and Ecobee 3 Lite do support Amazon Alexa and can be set up to work with the popular smart home speaker, Ecobee 4 has built in support. 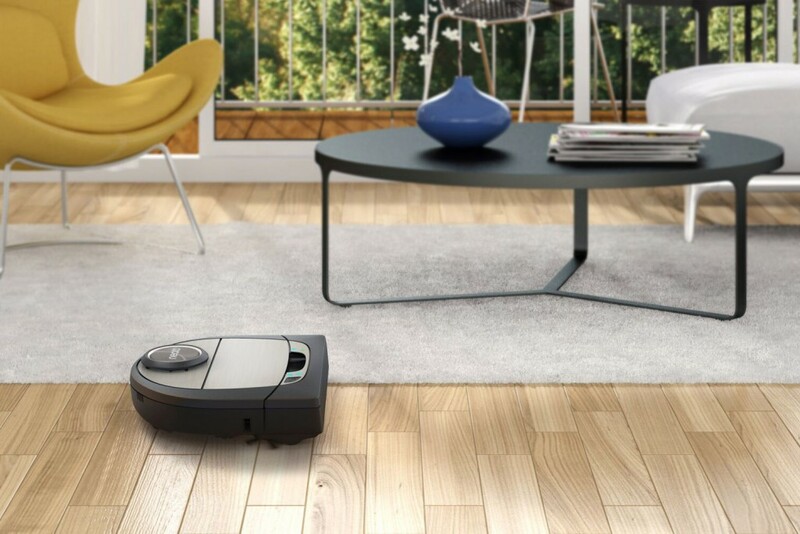 In addition, the new product from the line allows you to connect two additional accessories, primarily an HRV and ERV. 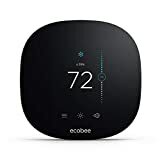 However, most enthusiasts still prefer the tried and true 3 and 3 Lite thermostats, as some Ecobee 4 customers do experience Wi-Fi and Alexa connectivity issues. One of the best affordable options with upgradability available on the market today is the Ecobee 3 Lite. Similar to its sibilings, the product can easily integrate with additional room sensors for full home control. Of course, as expected, the lite version of Ecobee 3 does lack some features. For example, it doesn’t work with accessory control, such as humidifers and dehumidifiers. Ventilators are also a thing you won’t be able to control with this device. Plus, the Ecobee 3 lacks an occupancy sensor so you are giving up on certain home automation features. Nevertheless, the device works just fine as a smart thermostats and is compatible almost all residential heating and cooling systems. 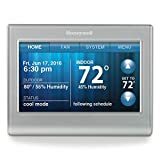 In case you are not sold to the whole “app” and “Amazon Alexa” voice controlled ideas, the Honeywell Wi-Fi 7-day programmable Touchscreen Thermostat might be a great choice for you. Lacking the better “smart” features of its slightly more expensive brother, but it is nonetheless programmable to an extent. Of course, you’d have to have a Wi-Fi connectable device to create the initial setup and take advatange of those features. But if something affordable and easy to install is on your list, that you are willing to tinker with to get to work at your best convenience, then this product might be the right purchase for you. 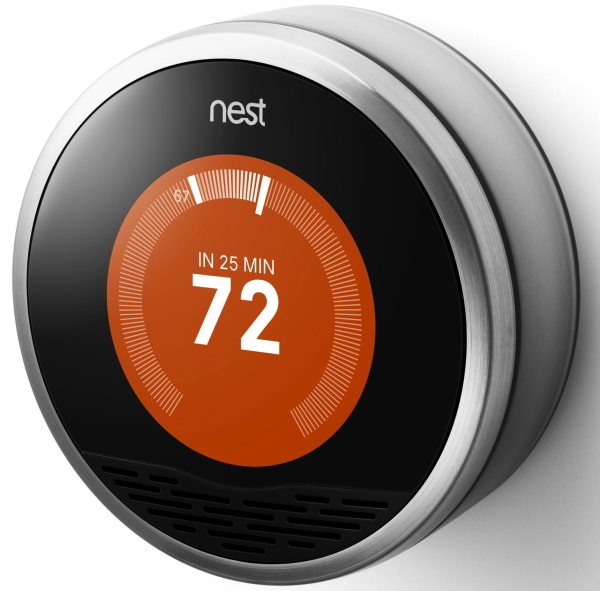 The Nest Thermostat E is the introductory product of the Nest family. Working perfectly with both Google Home and Alexa, the product is an affordable version of the Nest Learning Thermostat 3rd Generation. 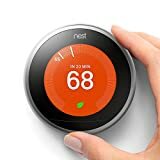 For its price, the product comes with a nice variety of features including Nest app support and proven energy saving functionality. With a sleek design that blends into the background, the device is not compatible with all accessories, but it is definitely a nice introductory choice for most households that want to try their hands on a decent smart thermostat with a futuristic-looking design. If you want to make your smart home a tiny bit smarter and save on your energy bills, then this product is definitely the right choice. There are two broad types of smart thermostats: some will learn from your behavior and adjust themselves automatically without the need for programming, while others offer internet connectivity to remotely manage and program your HVAC setting. The very best thermostats do both. The following are some important features you should consider as you shop for a smart thermostat. Along with choosing between these two broad categories of smart thermostats, you will need to look for an extra feature if you have a heat pump. Heat pump systems benefit from a heat pump balance feature, which allows you to choose how much auxiliary heat to use. Heat pumps are more efficient than other heating systems but they can take a long time to heat a home when it’s cold outside. Most are paired with powerful auxiliary heat that is far less efficient but turns on when the heat pump alone is not heating the home fast enough. Most thermostats offer a single way to control this expensive auxiliary heat: an AUX lockout temperature. A heat pump balance feature means you don’t have to worry about setting a lockout temperature. Instead, just choose whether you prefer comfort or savings and the thermostat will automatically adjust the lockout temperature for you. Most smart thermostats today feature a very modern design that fits into any home far better than the old-fashioned beige plastic boxes. A slick design and attractive user interface will likely cost you more. If you prefer a lower-cost model, you can find cheaper smart thermostats that offer Wi-Fi connectivity and some type of scheduling with a less attractive style. Most smart thermostats offer Wi-Fi connectivity, which allows you to change your home temperature settings from anywhere as long as you have an internet connection. This can come in handy when you want to adjust the temperature before you head home from work, or if you’re away from home and know there’s going to be a major cold front moving in. Another benefit is your device will be able to make automatic software upgrades when they become available. Many smart thermostats can be controlled with a smartphone app, which allows you to adjust your home’s temperature on the go. Otherwise, you may need to sit down at a computer and log into a website to control your HVAC’s settings. If you choose a model that includes an app, make sure the app is available for your phone’s operating system. If you want ultimate control of your energy use, look for a smart thermostat that includes a monitoring system with reports and statistics. This allows you to track your energy use and see how much energy you use throughout the week or month to look for times when you waste energy and adjust your settings accordingly. Some models include real-time energy monitoring. One of the most popular features of a smart thermostat is its ability to program itself by remembering your manual adjustments and preferred settings. Some models, such as the Nest, even have an “auto away” setting that drops your system to a pre-set minimum when it does not detect movement for a certain amount of time, or if it’s installed near the front door and detects you walking past. Not all smart thermostats are easy to install, and most require at least a bit more than simply removing your old thermostat and attaching new wires and screws. Some models are easier to install than others, though. Consider ease of installation when you make your decision, or be prepared for the additional installation fee by a professional. Some thermostats can help you save even more by reducing air conditioning run time when the humidity in your home drops. These thermostats have humidity sensors that work with your home’s dehumidifier or humidifier to keep your main HVAC system operating as efficiently as possible. Other sensors you may appreciate include a motion sensor, a sensor for weather conditions, and a sensor that detects the equipment status. September, 2018 Update: Chapter Rising stars added with new products reviewed. I would advise to all thermostat manaufacturers to connect meter reading (zigbee protocol for UK meters) to theit products. For real insight in usage instead of suggestions. Save money, not leaves!